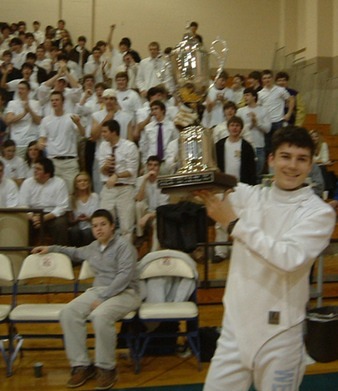 Peter Wetzel, MF/CAA Fencer and a member of the CBHS Fencing Team, went to battle Thursday night, Feb 19, 2010, to regain lost honor and treasure. At stake - the St. Michael's Cup - a large, overdone hockey-style trophy that symbolizes the hopes of MUS and CBHS Fencers each year. The hope is that their fencer will win that trophy! Wetzel entered the arena at MUS a bit unsure of himself. It wasn't his fencing that bothered him - it was the crowd. Normally when fencers face off, it might be in front of 5, 10 - perhaps 20 people - but usually NOT in front of several hundred friends, classmates, and opposing audience members. So the pressure was INTENSE! Wetzel warmed up with Coach Knowles in a side gym and spent some time thinking about his fencing strategy. Then it was time. Halftime had begun and the basketball players for MUS and CBHS filed out for their break. Meanwhile, the two fencers and their coaches entered the arena and quickly set up the scoring system. The crowd cheered both fencers upon their entrance. The sound was deafening - several hundred high-school age boys and girls all yelling and cheering. It was some amazing energy!! We could hear "WET - zel! WET - zel!" and on the other side they were cheering on Schoelkopf. It had begun. It took only a minute to set the system up and then it started. Wetzel was on the left and Schoelkopf was on the right of Brad Kroeker, who was directing the bout. "On guard! Ready? FENCE!" Kroeker had to practically yell since the fencers were wearing masks and the crowd was SO loud. They started moving towards each other. WATCH THE VIDEO HERE OF THE BOUT. WETZEL IS ON THE RIGHT. Wetzel timed his attacks perfectly and used the crowd to try to psych out Schoelkopf. Wetzel wound up scoring 4 solid points before Schoelkopf got one. They were fencing to 5 points so Schoelkopf had LOTS of ground to make up if he was going to win. However, after giving up the one point, Wetzel shut the door on Schoelkopf with his final attack, winning the bout 5 - 1. It was a great bout for Peter Wetzel, especially since he had LOST the St Michael's Cup in 2009. The victory was all the more sweet since it was at MUS and in front of their home crowd. Finally, the CBHS Basketball team wound up winning as well 50 - 33. We like to think Wetzel's victory was their inspiration to slamdunk MUS! Who knows? Anyway, CONGRATULATIONS TO PETER WETZEL for his 2010 St Michael's Cup Victory!